There has been an age old question that scientists could not answer: Why is the flu most prevalent in winter? The conventional wisdom has always been that the flu occurs in the colder months because viruses flourish in the colder weather. Not so! The evidence has been around for many years, but, as with so many truths, no one was willing to give it credence until they were willing to look at another theory. Dr. R. Edgar Hope-Simpson, a British M.D., did some record keeping and connected flu outbreaks with the shortest day in the year, which varies depending on how far, north or south you are. In the tropics, the shortest days are usually in their rainy season with overcast skies. He postulated: Is it possible that the lack of sunshine caused a shortage of vitamin D, which was connected to a vulnerability to the flu? A fascinating new theory seeks to explain why the flu takes hold during the winter months and why it infects mostly the elderly and those who are more sedentary. Now that we have proven by deduction that vitamin D may have something to do with immunity to the flu, let’s take a look at some scientific evidence. Adrian Gombart of UCLA reported that vitamin D boosts production in white blood cells of one of the antimicrobial compounds that defends the body against germs. The antimicrobial is called cathelicidin and its main targets are bacteria, viruses and fungi. The production of cathelicidin in the body is catalyzed by the presence of vitamin D and there is a direct connection between low vitamin D levels and low production of cathelicidin. This rather convincing evidence should have you checking your vitamin D intake. How many days do you get direct rays of the sun on even 20 percent of your body, much less a majority? Most will say: Never! We have become phobic about sun exposure and it has led to a massive amount of vitamin D deficiency present in our society. Amazingly, some people really have not fully embraced the importance of Vitamin D in their diets. One of the issues with Vitamin D is how it is formulated for better absorption and maximum impact for health. 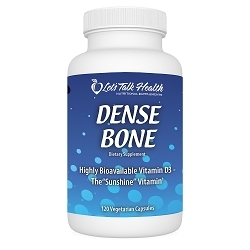 Our Dense Bone contains 2,000 IU of Vitamin D3, combined with Vitamin K2 and Strontium. Is Dr Donsbach still alive? I worked for him at Hospital Santa Monica as nutritionist/chef. I still marvel at his insights that “science ” is just now confirming. His wisdom allowed me to eat eggs, butter and several other healthy things thru all this time. I loved the old boy. Hi JW Seward…. Yes, Dr. Donsbach is alive and well…. but retired like you. I am his son-in-law. He comes up to visit ever Thursday for lunch. I will pass along your greetings. He will get a kick out of the fact that you happily ate eggs, butter and other healthy stuff the medical community said was “bad” for us.